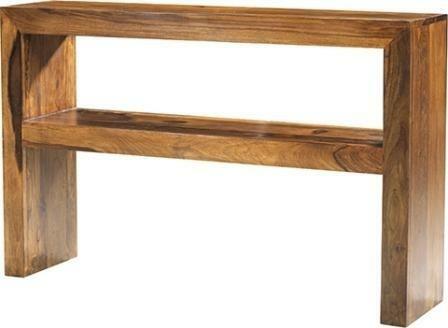 This simple console table is made out of high quality solid sheesham hardwood. That means that it has been designed to last for a lifetime. Its simple design is both modern and striking. The whole table is supported by two thick large legs. These hold up the table and also give it a stylish craftsman appearance. In the middle of the table is a single shelf. This will be a convenient place for keeping books, DVDs, CDs, or any other household items that you want to keep organized. The top of this console table will be a nice place for showing off items, like a lamp, vase or set of photos. The medium brown colour of this piece ensures that it will fit in nicely with your home, no matter what your colour scheme is. Width: 120 cm. Depth: 30 cm. Height: 77 cm.